Powerlifting squats are one of the most beneficial and functional exercises ever developed. But apart from the benefits, there are various dangers associated with this particular form of exercise. As you have to carry enormous weight during this particular form of exercise, it is quite understandable that there are chances to get unbalanced. In such cases, you might end up damaging your muscles. To avoid such problems, you need to take special care of your feet, and that can be effectively done using the powerlifting squat shoes innovated by various sportswear brands. In this article, we will review various shoes appropriate for squats. At the end of the article, you will know which pair of these shoes is right for you. If your workouts are focused exclusively on lifting, then you may want to consider a pair of specialized OLY weightlifting shoes. While heavy, they offer some serious stability and a very stable platform. You’ll probably find yourself achieving some personal bests, if you’ve previously been using running shoes or cross-trainers. One of our favourite lifting shoes is the Reebok Legacy Lifter. While new to the scene, it’s a serious shoes at a very reasonable price. The straps allow some customization, and also lock your feet in place so they’re not sliding around during squats. People that try them, really seem to love them and comment on who secure their feet felt in them. They’re also great if you have wide feet, when compared to other brands of lifting shoes. Want a pair of squat shoes for workouts not focused exclusively on lifting? Keep on reading! The material used for manufacturing this particular shoe is synthetic mesh. This shoe is designed especially for carrying out several sports-related activities. The lower portion of the internal part of the shoe consists of rearfoot gel, which keeps the high arches comfortable. Running for long hours does not result in pain in the arches. The sole in this particular sports shoe is very flexible, which results in proper function even when a load of weight is on the higher side. This footwear is light in weight, which allows moving at fast pace to be easy. If you want to perform efficiently in the gym, then this is the footwear you were looking for. New Balance is a company-well known for the sport shoes they manufacture. This version of the cross trainers, MX797v2, is specially designed for male cross-training freaks. The performance of the shoes can be well experienced in the gym as well as in the field. The exterior cover of the shoes is made using the synthetic products and breathable mesh. These products are so smooth that enough air can pass through the space into the shoes. This results in the interior staying fresh, and the growth of bacteria is controlled. Not only that, but the chance of a bad smell because of sweating feet is prevented. The reason is that the incoming air keeps the feet free of sweat. The interior cushions allow the feet to rest and handle high pressure with ease. As the feet are supported while performing the powerful crossfit training programs, injuries are avoided. The cushions placed on the sides of the cross trainers help the leg avoid getting hurt during sideways movements. This particular feature makes this shoe a special one. 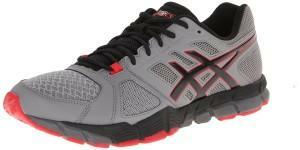 Asics is known across the world for the great, quality products it manufactures. When it comes to different types of footwear, Asics has the solution ready on the table. This particular footwear is not manufactured in the USA, but it can be order online. The material used for making this shoe is synthetic mesh. The sole provided in the shoe is synthetic; as a result it can withstand every harsh condition during training, either in the gym or in the open environment. These shoes are best for running long distances, and they are manufactured especially for men with high arches. The engineering of this particular product makes sure that you rise in terms of your performance in the gym. Puma has been engaged in the procedure of manufacturing sportswear since its debut in the market. The shoes made by Puma are well-renowned for the performance they generate and the durability of those products. The Tazon 5 is a specially designed cross-trainer for men. The interiors of the shoes are well engineered to fit the feet of male athletes and fitness lovers. Once you have drawn these gears onto your foot, you will feel like you’re walking on the clouds. The mesh cover on the shoes allows air to circulate abundantly into the shoes and provide our feet with enough resistance to sweat. Avoidance of sweat in our feet prevents the emergence of the bacteria, which results in a stop the growth of bad scent. The laces of the shoes allow the user to tighten the shoes according the size of their feet. As a result, the chance of the foot gears loosening is avoided. These specially-designed shoes provide enough support for the feet muscles, and as a result, the balance of the body is maintained and the benefits of the cross-training is utilized to the maximum. The PUMA Men’s Cell Surin Cross-Training Shoe has been specially manufactured for undergoing tremendous pressure generated during the powerlifting sessions. Not only that, but the shoe has also been designed for carrying out the crossfit training schedules as well. In terms of performance, the Men’s Cell Surin Cross-Training shoes are the best. Various criteria was kept in mind before manufacturing these cross-trainers. The interior cushioning provides the feet with maximum support. As a result, chances of imbalance are reduced to a minimum. These shoes are subjected to withstand enormous amounts of pressure without getting torn. The durability of the shoe is assured by the quality of materials used for making the shoe. The synthetic mesh promotes proper circulation of air on the feet, which keeps the feet dry even after hours of intense training. The laces placed in the shoes allow them to perfectly fit the feet. During hours of heavy training, the shoe’s light weight allows the feet to move without hassle. The toe space might not fit certain feet. You might have to order shoes that are bigger than your regular size. The section of the article has consisted of all the shoes that have been specially designed for men who are interested in performing powerlift squats. In the next section, we will review similar shoes, but the main difference is that they are made for women. Let us check it out. If you are looking for the perfect shoe with all the qualities needed in a crossfit training shoe for high arches, this particular foot wear model is the right thing for you. The synthetic mesh used for this shoe makes the product very useful for working out in hard conditions. This shoe helps its mistress boost up her performance in the gym. The weight of this shoe is extremely light, which allows it to be the best ride. The rubber sole makes sure it performs well in all conditions. This particular shoe is very flexible. The RYKA cross-training shoe is specially designed to match the criteria of a female foot; as a result, the performance of the shoe is very useful for a woman. Reebok has once again come up with the shoes that are specially engineered for yielding the best results during crossfit training. These shoes are specially made for the feet of women. The interior of the shoe is designed in such a way that the foot is rested and the balance is maintained properly. This particular shoe is renowned for withstanding the enormous pressure generated during crossfit training. As women’s feet need more care and support, the cushions have been placed in the shoe for keeping the feet safe. The most amazing feature of this shoe is that the buildup of heat due to friction is avoided. This results in the reduction of irritation to the feet. This also prevents the shoes from getting damaged easily. The breathability of the material used for the shoe is also well reputed. It keeps the feet dry and helps avoid sweating. Several customers have reported that the price of this particular shoe is on the higher side. Keeping the needs of women’s feet in mind, Adidas has come forward with the Running Liquid 2. The shoe, as its name suggests, is specially designed for the feeling of liquid wear while undergoing heavy pressure exercises. The most interesting feature of this shoe is that they do not obstruct heavy workouts. The feet feel to be without any additional weight, which allows proper movement without any obstruction. The foot bed in these shoes are provided with soft yet stable cushions that keep the feet well supported and avoid damage of the foot muscles. The emergence of a bad scent because of bacteria is avoided by the synthetic mesh used for making the shoe. The breathability of this particular material, as we know, is well-renowned for absorbing sweat and circulating air into the interior portion of the shoe. There are protections placed in the interior of the shoe for keeping the feet protected from any damage by the external sources. Thus, these shoes are the best options for women to wear at the gym. But in case you are interested in long distance runs, these shoes can also be worn outside and are the best friends you can ever get. Reebok has arrived once again with the best quality products for undergoing high pressure crossfit training programs. The rubber-made sole keeps feet resistant to enormous pressure, and the material used for making the interiors of the shoe keeps feet free of irritation. As we know, imbalance can cause serious damage to the feet. Such a problem is efficiently avoided with this sole. An additional protection is provided to the shoe that allows feet to stay protected from external objects. The women’s Crossfit Sprint TR Training Shoe is designed in such a way that the air comes inside the shoe efficiently and does not allow the feet to sweat. Therefore, the interiors of the shoe stay clean and dry. These shoes are subjected to deliver high performance in the gym. They can also be a good choice for running. The cushions that are placed inside the shoes allow easy sideways movements, which is a basic step in crossfit workouts. The foot bed is designed in such a way that feet feel comfortable even when conditions are harsh. After reading this article, you should be able to understand the various specifications that you have to check out in powerlifting shoes. The shoes that have been mentioned above consist of all the qualities that would benefit your feet while doing powerlifting squats. Hence, now you can choose the best pair of squat shoes according to your preference while yielding the maximum benefits of a rigorous training schedule.